I imagine my affinity for Beefheart followed a trajectory familiar to many. It began with a bizarrely alluring earful on John Peel; leading next to the perusal of a few rock encyclopaedias and the NME and Sounds Greatest Albums lists of the time (1985); followed subsequently by the purchase of Trout Mask Replica; then swiftly by the indignant return of said item to the record store. Even as I handed my tenner over to the hippy at the HMV till, his derisive expression let me know in no uncertain terms that he fully expected me back within 24 hours. He was of course correct. My virgin ears felt like they had been defiled and my brain pillaged by this artless racket, created by people who clearly had not taken the trouble to learn how to play their instruments. I was inclined to steer clear of Beefheart for some considerable time afterwards, but as I became ever more conscious of Trout Mask’s conspicuously lofty critical approval rating, my frustration began to grow. Was I missing something? Perhaps I was the victim of some cruel hoax? I resolved to find another way to appreciate the Captain’s art, if indeed this really was ‘art’ at all? Art. Don Van Vliet always had a fascination with art, demonstrated most visibly in his own primitively idiosyncratic paintings, but extending also to his music, the prime expressions of which are the two albums he made for the Straight label in 1969 and 1970, Trout Mask Replica and Lick My Decals Off Baby. Every Beefheart aficionado has their favourite album and I am no different. In fact, not selecting Trout Mask Replica for TNPC feels in some ways tantamount to a betrayal, but it is a record which has been extensively discussed, written about and salivated over elsewhere, and whilst undoubtedly amongst my own Top 3 Albums of All-Time, I fear there is nothing much else to add to what is a well-worn story. Those who find ‘TMR’ too arduous a listen [I had to strengthen my constitution with the solid meat of the early Fall albums before I persevered and eventually succumbed] tend to plump instead for the crisper cleaner Clear Spot, the warmer more colourful Shiny Beast or more commonly, as in the estimation of the authors of The Perfect Collection, the classic 1967 debut, Safe As Milk, which memorably showcased Ry Cooder’s stunning slide guitar work. 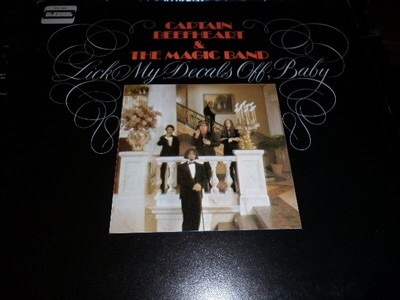 While these albums served as friendly pathways to a reappraisal of TMR, my way in to Beefheart actually came with the purchase of Lick My Decals Off Baby. Those who treasure TMR may feel that it’s slick sibling sequel gives it a run for its money as The Magic Band’s greatest moment, despite it having lived forever in the shadow of its illustrious predecessor. Indeed, there are some who swear that Decals actually eclipses ‘TMR’ as Beefheart’s finest hour, but be as well comparing Ulysses to Finnegan’s Wake. Nevertheless, those will point to the following: Decals – unlike TMR, which bore the imprint of Zappa – was produced by Don himself and is therefore incontestably his own creation; secondly, where TMR is a sprawling mess, Decals by comparison is both streamlined (all killer, no filler) and strangely symmetrical (both sides have overtly lascivious openers, anarchic hornfests to end, and in the centre, two baroque math-folk instrumentals, Bill Harkelrod – aka Zoot Horn Rollo – conjuring that almost medieval lute-ish sound from his guitar); thirdly there is a greater refinement of song composition and structure – where TMR sounds like a bizarre experiment, the playing on Decals sounds more controlled, sophisticated even (visually implicit in the contrasting choice of band costumes for the album sleeves); fourthly, the polished marimba of Art Tripp brings another dimension to the sound, working a similar effect to Bobby Hutcherson’s vibraphone on Eric Dolphy’s classic Out To Lunch. These for some give Decals the edge. If the words are wonderful, then the music is a match for them. The album’s most famous song – covered by The Buzzcocks/Magazine – is ‘I Love You, You Big Dummy’ (‘nobody has love/love has nobody/I love ya y’ big dummy/quit askin’ why!’), a rhythmically straightforward thrash enlivened by Don’s wild harp (it sounds like he’s blown it to pieces), which could be a demented cast-off from Strictly Personal and anticipates the unabashed blues growl of his next studio album The Spotlight Kid, while ‘Woe is Uh Me Bop’ – which ‘crinkles along mechanically like walking Tinkertoys’ (copyright Lester Bangs – I can’t beat that folks) is a virtual blueprint for the triple salvo of Tom Waits Franks Wild Years period, the most obvious comparison being ‘Clap Hands’ from Rain Dogs. The marimba here adds little strokes of light which de-intensify the urgency of the rhythm. Conversely, on ‘The Smithsonian Institute Blues (or The Big Dig)’ the sudden change of tempo, with the marimba and guitar scattering in opposite directions, unseats a vibrant footstomper, yet showcases the band at their most viscerally spontaneous and intuitive. Again there is a delightful play on words (“It sure looks funny for a new dinosaur/To be in an old Dinosaur’s shoes/Dinah Shore’s shoes/Dinosaur shoes”). There are other delights and surprises along the way, not least the interval in the closing ‘Flash Gordon’s Ape’ (great title) where the orgiastic cacophony is halted for a marimba solo. No-one else in rock music has innovated on the same scale as Don Van Vliet. Oh, The Beatles and The Velvets could stake a claim, and were undoubtedly even more influential. But with his music, Beefheart invented an entirely new art form. I can’t pretend to be an art connoisseur, and I’ve never really understood the Jackson Pollock analogy – I’ve always imagined each splash and stroke of his work to be something of an accident. Nor – though I appreciate the visual image it conjures – can I fully agree with Andy Partridge’s contention that Beefheart’s music “sounds like a piece of the Somme, lifted up and put in an art gallery.” Another fairly unsatisfactory comparison would be that of a collection of jigsaw pieces fitted randomly together, as this presupposes a final abstract image without a recognisable pattern or design. Instead, when considering a Beefheart composition from this period, I prefer to visualise four or five light aircraft taking off together which also land simultaneously: but while airborne, the planes might fly at different altitudes; some are faster than others, each creating its own unique flight path, until at certain points, as if jerked by some centrifugal force, their zig-zag wanderings cease and they line up with Red Arrows precision. Again, they may fly off suddenly in wildly different directions before this telepathic convergence repeats itself. From one journey the planes may return to the ground at awkward angles, from the next they arrive in neat lines. This sound has been imitated by many performers of good will – aesthetes, punks and outsiders, but each has been too indebted for true greatness. Beefheart’s innovations are unique in rock history and alongside its big brother TMR, Lick My Decals Off Baby deserves to take its place as a uniquely esteemed example of American art primitivism.